It’s close enough now that I’m starting to believe it…Spooky Man and I are going to the Oregon coast for a week at the end of August. This will be our third vacation in nearly 26 years of marriage. The last two times we went on holiday, I was unemployed at the time; this year that doesn’t seem to be the case. 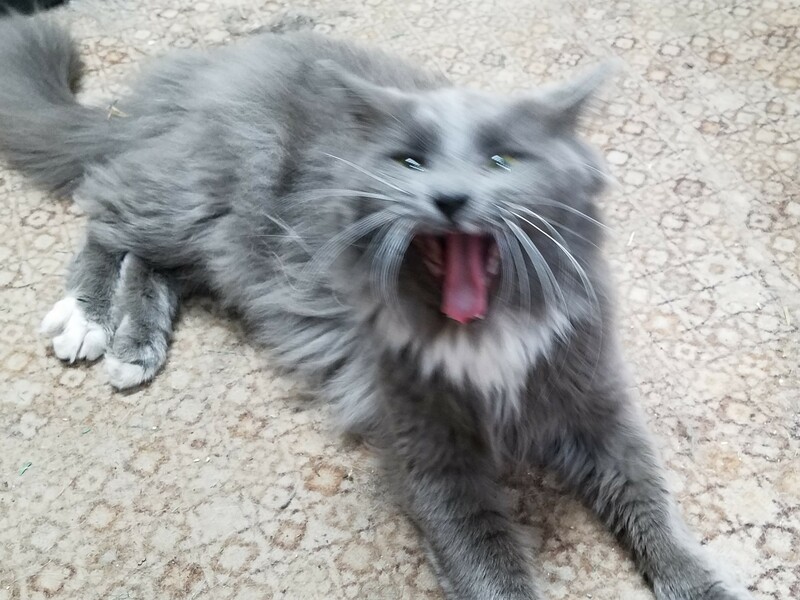 I’ve got the dog and indoor cats (on their special diet because they are somewhere between heftychonk and megachonk) scheduled for the kennel, a house sitter lined up, and my special login for work. Yes, I will be working for a few hours because I have translations coming back that week, but I’ll be doing it over coffee from our hotel, looking out onto the ocean. I’ll also be working on Kindness of Strangers. Because cat pictures. And because he is a fluffy beast. 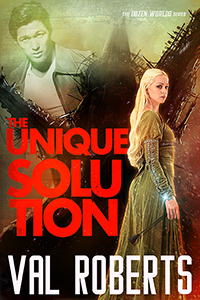 The Unique Solution is for sale! Muppet flail! Because it’s no longer a pre-order, it’s out and proud and for sale. This is me happy dancing all the way to the day job. Just wanted to drop a note to let you know I’m not resting on my laurels (they’re actually kind of scratchy) now that I’ve finally got Talyn’s story finished and up for preorder. I’m currently working on the story of Rahmsin Singh and Chandra Ramasamy, the third in the Ganymede Survivors Romances. I’m calling it Kindness of Strangers as a working title. With a little luck, it will be ready for prime time in September, but every time I’ve given myself a deadline, something happened to completely throw it out the window–so don’t quote me on that. Life happens. And sometimes a lot of it happens at once. Okay, back to my major episode of Life. The winter of 2016-2017 was the most severe my town has seen in a long time — in a place where six inches of snow that melts in three days is a lot, we had three feet of snow on the ground for a couple of months. We lost commercial buildings to roof collapse, including the only grocery store in Oregon-Idaho border town Weiser, Idaho (where my father grew up). In my own neighborhood, carports and garden sheds succumbed to the snow load, and one of the carports was ours. It collapsed on top of my car, our freezer, the air conditioner, and other stuff we had stored there. Plus the spot where my husband leaves out food for the neighborhood cats. It was an amazing mess. We got the worst of it cleaned up, repaired and replaced by the end of April, but we’re just now getting the AC motor replaced, and I still have to get the paint on my hood fixed. We also had the backyard re-landscaped by professionals, because we couldn’t get back there for several months and things went to heck. Also because Spooky Man had wanted to redo it for a decade, and we’re in no shape for that kind of work. During this time I was also actively looking for a day job, and I found one in a call center where I stayed for four months before I landed a “perfect job” managing localization for commercial printer software. But enough about Life. I have something important to tell you: I finished the sequel to Blade’s Edge. Let’s pause and allow that to sink in for a moment, because there have been years when I wasn’t sure I would ever get to The End. I finished it. Happy sigh. It’s called The Unique Solution, and it’s the redemption of the evil twin, Talyn Penthes. She wasn’t an easy villain to redeem, and this book took nine years from start to finish. Nine. Years. That character fought me every step of the way, but I finally got her story out of my brain. The second edition (or the Wylde Hare Press edition) of Blade’s Edge will be for sale in ebook as soon as I can get it uploaded to all the retailers. The Unique Solution will be available for pre-order by the end of the week. Look for paperback versions in a month or so. Audiobooks are on a longer time horizon. Maybe next year, because there’s a significant learning curve. The evil day job and I have parted company (and it wasn’t evil at all, I quite liked that job) and I’m looking for work in western Oregon and Washington. The reasons are varied and, well, personal. My point is that there is likely an interstate move in my future, after fourteen years in the same house. Kindness will set up the second trilogy of Strike Force stories, what happens with the ‘ghosts’ — those strikers whose bodies didn’t survive the friendly fire incident: Captain Dressler, Whisper, and Grimtoo and LC. Here’s a hint: they find that special someone. It also starts the process of connecting the Strike Force Stories to the Human Diaspora universe, which actually was a bit of a surprise. Apparently my subconscious likes connecting storylines. Speaking of the Human Diaspora series, Tetsuo and Akiko’s story is next on my to-do list. 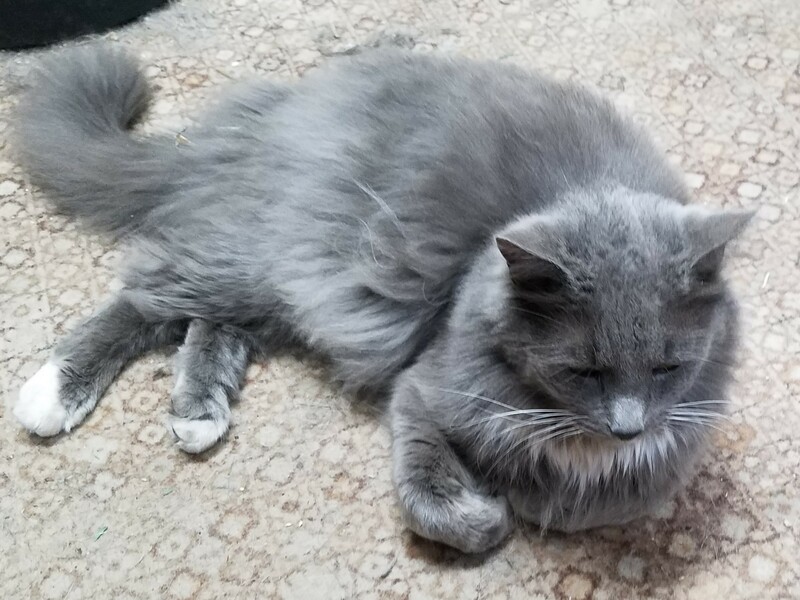 In non-writing, non-day job news, all the furbabies are happy and healthy, and Spooky Man has a new project cat, a completely gray intact male shorthair known as Shadow. As soon as he’s domesticated enough, we’ll get him fixed. He’s still too shy for me to get a decent photo, so stay tuned. After recovering from the breast cancer reconstruction that refused to cooperate (no, I will not go into details as I don’t want to freak out anyone; let’s just say I burned off some bad karma), I dove into The Ocasek Opportunity, the story of Tasha’s little brother and how he saved two civilizations from the boogeyman aliens. Currently, it’s resting before I start editing the first draft into a book. Now I’m fighting with Kindness of Strangers, the Ganymede Survivors story of Colonel Singh and the elusive Chandra Ramasamy. And I’ve got one more editing pass on The Unique Solution–the redemption of the evil twin from Blade’s Edge–before I can get it published. I’ve written more in the last year than in the previous several, just none of it on my website/blog. So now you know. Way back in the nineteen-mumbles, I took a programming class. I was in the very last class at my university that started Fortran programming on punch cards. Yes, punch cards. You can buy them on Etsy as antiques. The professor thought we should know how bad his generation had it so we would appreciate dumb terminals (insert eye-roll here). At any rate, the mini-mainframe system was so amazingly primitive that your program output might be a single sheet of paper (with tractor-feed margins still attached, of course) that bore the message “Syntax Error”. Which meant you had screwed up in punching one or more of your cards and the resulting code would not compile correctly, let alone run and give you the results you had to turn in for a grade. Luckily, English is extremely redundant and the human brain is highly resilient (unlike computers). We can interpret statements full of syntax errors, although a personal opinion of the speaker/writer’s intelligence might be revised down in the process. Unless English is not his or her first language, of course; syntax can be tricky to port between different grammatical systems. For example, French uses postpositions, positional-descriptive words that are placed after a noun phrase, as well as prepositions. When French is transliterated to English, you sometimes get sentences that sound like Yoda came up with them — full of syntax errors…in English. Genre fiction publishers are reluctant to include semicolons in books, because they believe (or so my editors have said) readers can’t understand them. Not fair, really, to either readers or the semicolon, but there it is. The result, if the writer is using the punctuation correctly, is unnecessarily choppy prose or (shudder) comma splices without appropriate conjunctions. In other words, syntax errors. Many syntax errors are so common they’ve become idiom (a nice way of saying everybody does it so grammarians have given up), which is why idiom is almost untranslatable — it didn’t actually make sense in the first place, so moving it into a different language is tricky at best. Study your syntax, be aware when you’re using idiom. Control it; use it for effect and not just because it’s the first thing that comes to mind. Just because everyone is doing it does not make it right, or good, or readable twenty years from now when idiom and syntax have moved on. If you do that, you’re less likely to include the word “hassle” (origin in the late 19th century, rarely used before 1950) six times in a Regency romance novel. Back to the word mine….